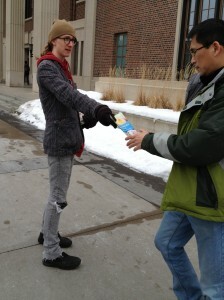 We handed out more than 5,000 leaflets at the University of Minnesota, Twin Cities, to encourage compassionate food choices. The cold and the snow didn't stop us from passing out 5,047 Vegan Outreach leaflets on Monday, March 11! John Oberg joined us as he hands out leaflets at colleges across the country. This is one of the highest number of leaflets ever passed out at a college campus, and we did this even with poor weather! Do you want to help animals and missed this opportunity? Please join us April 15-19 for Minnesota College Leafleting Week! Dozens of volunteers will spread the word even more widely as we hand out leaflets across the state. We're hearing from people every day that they are changing their eating habits to help animals as a result of our work. Thanks to everybody who helped out!